The Hot Sardines performing at Tanglewood's Ozawa Hall in Lenox on June 16. The members of this evening’s ensemble were Evan “Bibs” Palazzo, bandleader and pianist; lead singer “Miz Elizabeth” Bougerol; trumpet, Paul Brandenburg; clarinet and tenor sax, Nick Myers; trombone and ukulele, J. Walter Hawkes; drums, David Berger; guitar, Bob Parins; string bass and sousaphone, Evan “Sugar” Crane; and tap dancer A.C. Lincoln. The program, played without an intermission, consisted of traditional jazz classics (Runnin’ Wild, After You’ve Gone, Why Don’t You Do Right, Petite Fleur, Til the Real Thing Comes Along, and six songs associated with the legacy of Thomas “Fats” Waller: Minor Drag, It’s a Sin to Tell a Lie, Lulu’s Back in Town, Honeysuckle Rose, Dinah); two by George Gershwin (Crazy Rhythm, Summertime), Sweet Pea, Look at Me, composed and sung by Bob Parins, joined by Ms. Bougerol, who also sang three songs in French, including Petite Fleur and L’Amour s’en Fout). Sadly, notwithstanding their proclaimed intentions, this performance did not begin to express the musical roots and high standards of individual and collective improvising that distinguish the classical jazz tradition. Note the delicacy of Waller’s pianism versus the ponderous, clunky treatment of Palazzo’s. Listen to how Waller delights in the silliness of the verses with delicious rhythmic anticipations and suspensions, a light, toe-tapping “stride” left hand, perfect intonation and a natural voice, where Palazzo is square, nearly always thumping on the beat, bereft of left hand technique, and in lame imitation of Waller’s vocal, nasal to the point of distortion, frequently flat, and absurdly altering Waller’s send-up of Cole Porter’s exquisite lyric, “Miss Otis Regrets,” to “Mr. Otis Regrets”. Rather than approach the musical material with appreciation and respect, the songs became vehicles for hokey jokes and exaggerated technical displays. The one consistently nuanced and modulated performance came from the tap dancer, who picked up the subtleties, syncopations and accents of the many pieces in which he took extended solo turns, demonstrating the special connection between layered rhythm and melodic variation, like the best classical jazz soloists from Louis Armstrong to “Fats” Waller” to Benny Goodman and such modernists who revisit the tradition as Evan Christopher, Hiromi and Wynton Marsalis. More’s the pity because, with the exception of the pianist, each of the instrumentalists showed evidence of technical skill deriving from classical conservatory study. 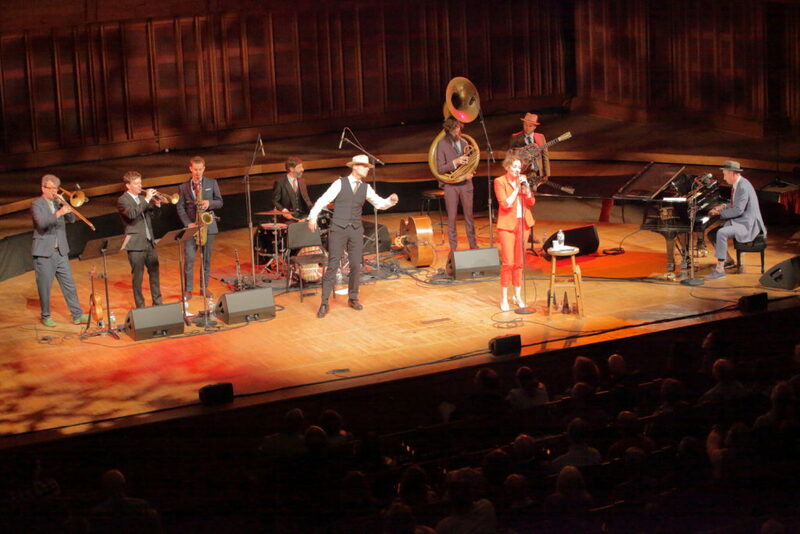 Specifically, the Hot Sardines showed neither knowledge nor respect for the African-American blues tradition and the careful listening within the musical ensemble that informs the distinctive textures and counterpoint of serious professional performance. These classically trained players were able, albeit with frequent and obvious errors, to navigate the harmonic patterns, or “changes,” of the songs. This manifested as a fraught and mechanical exertion, as trumpet, clarinet, trombone and string bass struggled to demonstrate what their instruments could do rather than to subordinate the heroics to the service of honest musical expression. This was especially problematic in the hands of bassist Crane, whose formidable classical chops betrayed him. He forsook giving a steady and consistent rhythmic foundation in support of his colleagues for high-register acrobatics and ostentatious leaps from the top to the bottom registers. After Crane lifted his large sousaphone to his left shoulder and lit into two numbers, it was evident that this was not his principal instrument. He could barely produce a coherent impulse, much less the lightly-swinging, forward-pushing, 2/4 “oom-pahs” that pieces like “Dinah” call for. Without a trace of knowledge or respect for the New Orleans “cutting contest,” where famous jazz musicians endeavored to outdo one another–partly in technical display but more importantly in alternating improvisations of challenging and creative musical ideas on an agreed-upon set of chord changes–the trumpet, trombone and clarinet competed in offering increasingly outrageous examples of gimmickry: in reaching, and frequently missing, high notes; in volume, most notably in the trumpeter’s bell-splitting massacre of George Gershwin’s Summertime; and in hokey, juvenile asides which brought chuckles but didn’t exactly entertain the audience. To this listener, Ms. Bougerol’s making fun of the name of the distinguished 1930s Chicago recording ensemble the Harlem Hamfats bordered on racism. And her jokey assertion that “Fats” Waller was kidnapped by Chicago gangster Al Capone to play for his buddies but then stayed for three full days because his booze was on the house not only perpetrated an uncorroborated rumor but pronounced a disrespectful allusion to the tragedy of the chronic alcoholism that presaged his pneumonia, which killed him on a cross-country train at the age of 39. Ms. Bougerol indeed mentioned the group’s dedication to Waller and his music. Apart from Pallazzo’s rough piano, the horns–most especially the unmodulated blatting of Brandenburg’s trumpet–contradicted the subtlety and style of Waller’s “Rhythm,” as he referred to his regular instrumental colleagues of Herman Autrey, trumpet; Harry Dial, drums; and Al Casey, guitar. I played a concert in New Hampshire in the early 1980s opposite a group led by Autrey and am familiar with most of his recordings. What was heard last night in Ozawa Hall crunched against the memory of his richly emotional, crisp, blues-inflected phrasing. I admit to being a “moldy fig” on the early jazz I so love, to borrow the term used by the beboppers of the 1940s to insult the jazz purists who didn’t understand their music, although I wholeheartedly support its honest reinterpretation by serious musicians of today. And I wish that the Hot Sardines would swallow their pretensions along with their liquor and listen carefully to the music of their forbears. I did so, armed with the tools of musical analysis, in this article in the 1977 Journal of Jazz Studies that focused on the “stride” tradition of piano playing in which “Fats” Waller played a central role. You can scroll down to page 59 to see how Waller fits into this fascinating musical story. And if you’d really like to try to play like him, you can puzzle out my faithful transcriptions on your piano. Do this at home, please, but do it lightly, thoughtfully and, above all, respectfully of the master. As a former member of the Hot Sardines that toured the world with them, I can say that this review is 1000% spot on. The above is why I left the band – I simply couldn’t take it anymore. The subtle racism, the atrocious singing and playing from the two “band leaders” and the horrid banter left me so empty inside that I nearly quit playing music for a living. Several of us left the band this past December. Personally, it was the single best decision I’ve made in my career. The Hot Sardines are a tragic example of what mainstream jazz has become; vapid, soul-less, un-intellectual noise pushed by suits lining their pockets with cash. As a former member of the Hot Sardines that toured the world with them, I can say that this review is 1000% spot on. The above is why I left the band – I simply couldn’t take it anymore. The subtle racism, the atrocious singing and playing from the two “band leaders” and the horrid banter left me so empty inside that I strongly considered quitting the music business for a time.